Could you please introduce yourself and tell us a little about your career to date? I’m Charlotte and following graduation from The Royal Veterinary College I’ve been working as a vet for 15yrs. After spending time in various practices in the UK, and volunteering in Mauritius for a fantastic animal charity for 6 months, I came to Village Vet. I’ve been at the Potters Bar branch for the last 11 years, and have spent the last five as Head Vet. 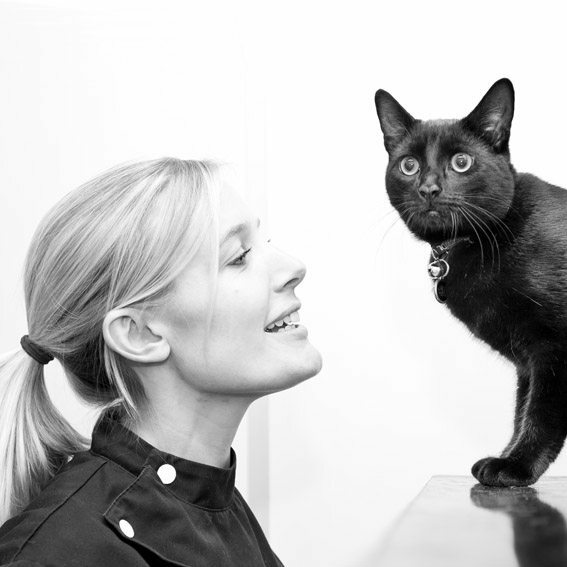 I enjoy all aspects of veterinary care, and have particular interests in dentistry and all things feline. Every pet is an individual and every pet differs in the way they would like to be treated. There have been real advances in recent years as to how to reduce stress and improve well being for patients visiting or staying with us. This is especially true of our feline friends and here at Potters Bar, we have been accredited with a Silver Cat-Friendly Award from the International Society of Feline Medicine. This means everyone in our practice understands the needs of cats and the clinic is more cat-friendly in our approach to handling cats gently and minimising stress during their visit. Myself and our Head Nurse, Ros Daysh-Sherlock, are ‘cat advocates’ for the award to ensure these standards are being met on a daily basis. Being a general practitioner means every day we see a wide variety of cases and potentially in a number of different species! We welcome almost all exotic species at Potters Bar as we are lucky to have one of our vets, Harriet Nicholson, close to completing a General Practitioner Certificate in Exotic Animal Practice alongside Coral Donoghue who has a Certificate in Veterinary Nursing of Exotic Species. No day is the same so it’s constantly challenging and rewarding. Why did you choose Village Vet? Village Vet strives to be at the forefront of Veterinary care in all aspects by investing in the practices and vets across the group. I particularly enjoy working at the Potters Bar branch as it still feels very much like a ‘local’ vet practice. We have a fantastic team of vets (Myself, Harriet Nicholson & Sally Fiske-Jackson) and nurses (Ros Daysh-Sherlock, Coral Donoghue, Jen Cronshaw and Karen Curtin-Landy) and as we are one of the smaller branches we really love having the opportunity of getting to know our clients and their pets really well. At your practice, what are some of the most common preventable ailments that you come across and can you provide us 3 top tips in relation to them for pet parents? A common problem we see on a daily basis, and sometimes multiple times a day, is pets who have become overweight and, in some cases, obese. Weight gain is usually gradual and often subtle, but can easily be checked each time you visit us in the clinic. Both the vets and nurses can advise on your pet’s Body Condition Score which allows an assessment of their weight and fat levels relative to their height and body stature irrespective of breed standards. Your pet could be overweight if it’s difficult to feel their ribs when you run your hands over the chest and if there isn’t an obvious ‘waist’ when viewed from above. Keeping your pet at their ideal Body Condition Score makes them less prone to succumbing to joint diseases, such as arthritis, heart disease and Diabetes to name a few and it can also extend their life by up to 2 years. So my advice would be to always check the recommended feeding guides on every food purchased as this can massively vary between types. Carefully controlling the diet and calorie intake helps so be sensible when giving treats too. Much like us, exercise helps too so increase the amount of exercise if you have a dog and there are no medical contraindications to doing this. Our nurses run FREE weight clinics to assess your pet’s condition and can offer guidance on feeding and can even prescribe specific weight reducing diets that offer a complete, balanced way of feeding your pet and are designed to help your pet feel full whilst offering a quicker way of successfully reducing their weight if needed.